Diego is a Financial Services Executive and Wealth Management Advisor with Barnum Financial Group. Working in the financial services industry since 2008, Diego’s practice is built on a foundation of providing objective, honest, and precise strategies. The work he accomplishes with his clients is based solely on providing tools to help them attain their financial goals and aspirations, while offering the highest level of personal service and ongoing education. Working with a team of financial services executives, Diego takes a collaborative approach when working with his clients to provide the customer service that they deserve. During his time at MetLife, Diego earned the honor of being named to a MetLife’s Leaders conference in 2016. This honor is awarded annually to those Financial Services Representatives who have successfully demonstrated the ability to attract, develop and retain clients by helping them meet their financial security needs. 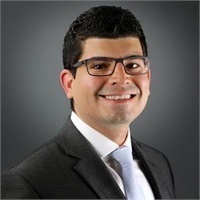 Diego earned his bachelor’s degree in Business Management with a concentration in Finance from Southern Connecticut State University in 2005. He holds his series 6, 7, 63, and 65 Securities Registrations and is also licensed to sell life, accident, and health insurance. Outside of work, Diego enjoys playing golf, camping, hiking, skiing, and playing with his Great Dane, Brutus. Also in his spare time, he likes to participate in volunteer work to give back to the community. Diego lives in Branford, Connecticut.